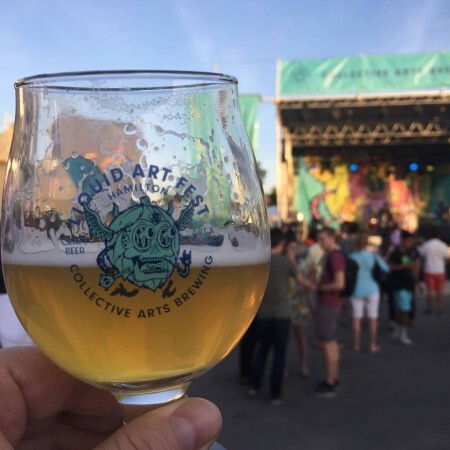 HAMILTON, ON – Collective Arts Brewing has announced the launch of early bird ticket sales for the 2nd annual Liquid Art Festival, a celebration of “international beer, art, and music” taking place at the Collective Arts brewery in Hamilton on June 14th and 15th, 2019. As with the inaugural edition this past June, more than 50 breweries from Canada and around the world are planned to be on hand and pouring new and rare beers, many of them never available before in Ontario or Canada. The event will also feature live music and DJs, mural artists, art galleries, screen printing, food trucks, and more. For the 2019 festival, tickets will be all-inclusive with no tokens required for beer service. Attendees are reminded, however, to “enjoy responsibly”, and all staff pouring beer will be Smart Serve certified, ensuring that overly intoxicated patrons will not be served. Tickets for the Liquid Arts Festival are available online now for $69.95 (plus fees + HST) per session – 7:00 to 10:30 PM on Friday June 14th, and 1:00 to 4:30 PM or 7:00 to 10:30 PM on Saturday June 15th. A “Mothership” option that offers admission an hour early is also available for an additional $10. Early bird prices will remain in effect until December 31st, 2018 or until the ticket allocation is sold out, with general admission tickets going on sale on January 1st, 2019, the same day that the music line-up for the festival is announced. For more details, see the Liquid Art Festival website.